This trio is an excellent sampler of three different teas. 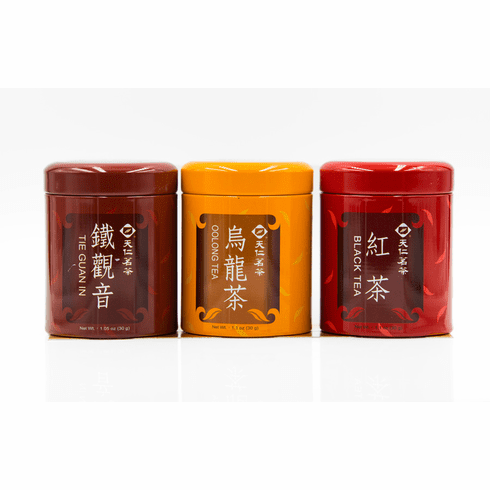 It contains one canister of Ti Kuan Yin tea, one canister of Tung Ting Oolong tea, and one canister of Black tea. Each canister contains 1.1 ounces (30g) of its respective tea. The steeped Ti Kuan Yin tea has a golden brown color with a roasted aroma, a strong roasted taste with a softer roasted aftertaste. The steeped Tung Ting Oolong tea has a light brown color, a lightly baked aroma with sweet undertones, a lightly baked taste and a sweet and lightly baked aftertaste. The steeped Black tea is rich brown with a sweet roasted aroma and a creamy mellow taste. Shipping weight is 0.66 lb.